Stemflow is water that starts out as a falling raindrop, but on the way down it hits a leaf or a twig. Much of this intercepted water starts to move over the surface of the leaf or twig to a branch and then to the stem. At that point it becomes part of a tiny river known as stemflow. While stemflow is only marginally interesting to humans, both the quantity and quality of the stemflow can mean life or death to epiphytes, the small plants growing on the surface of larger plants like trees. 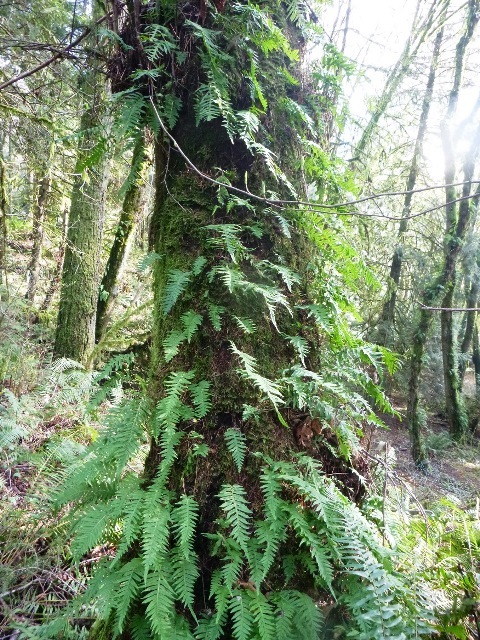 The most obvious epiphytes at Tryon Creek State Natural Area (TCSNA) are moss, lichens and licorice ferns (Polypodium glycyrrhiza). How is stemflow different from ordinary rain? The chemical properties of stemflow are vastly different from those of free-falling rain. One study of stemflow on bigleaf maple (Acer macrophyllum) found that stemflow had a significantly higher concentration of the plant nutrients calcium, magnesium, sulfur and nitrogen than did raindrops. These chemicals apparently came either from dust that had been deposited on the branches since the last rainfall, or they were leached by the raindrops from the bark itself. In addition, stemflow was less acidic than raindrops. In a study of stemflow on red alder (Alnus rubra), a nitrogen-fixing species, the stemflow contained 11 times as much life-sustaining nitrogen as raindrops. In contrast to bigleaf maple, the stemflow of alder was more acidic than the raindrops. Numerous studies show that different species of trees produce stemflow with different chemical properties. It seems reasonable that the chemical differences in stemflow between species of trees would influence the amount and kinds of epiphytes growing on those species. So how much stemflow is there on a tree trunk? Depending upon the kind of forest, researchers have found that the amount of stemflow is generally between 1% and 5% of the total rain that falls. The amount of stemflow on a tree of a given crown size varies depending upon how the branches are attached to the trunk, and how rough the bark is. How do tree branches effect stemflow? Tree branches can be attached to the main trunk of a tree at many different angles. 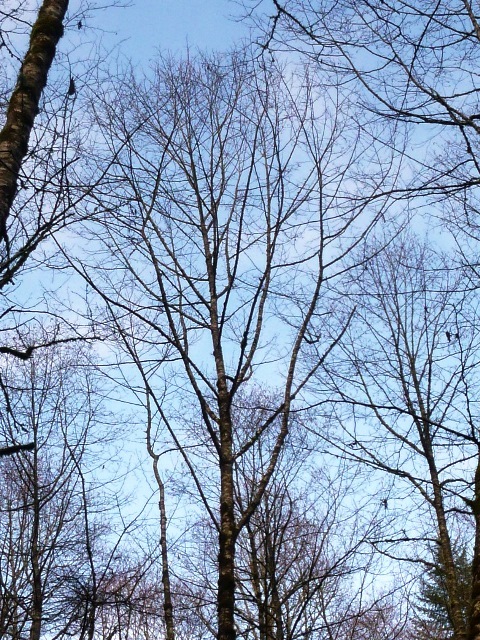 If the branches point strongly upwards (as in the red alder pictured below) any rain hitting a branch will probably run right down to the main stem. 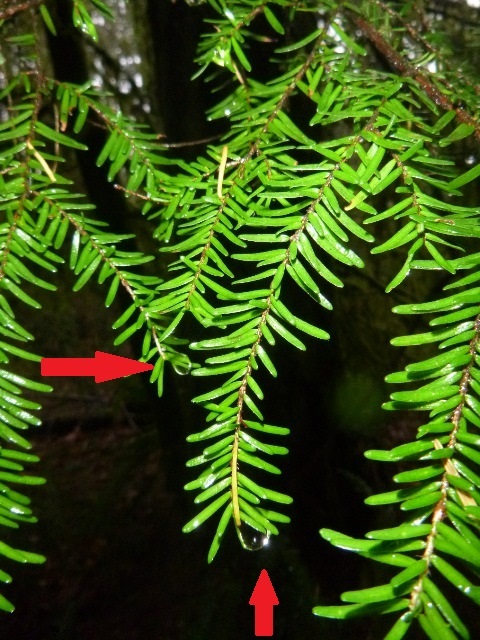 However, if the branches are attached to the trunk horizontally, like they are in the western redcedar (Thuja plicata) pictured below, if a raindrop hits the branch, it probably won’t flow to the main stem and become stemflow. Another factor which apparently hasn’t drawn the attention of researchers, is whether or not the foliage is droopy. Two of TCSNA’s conifers have extremely droopy small twigs and foliage. You can see that in the western redcedar pictured above. 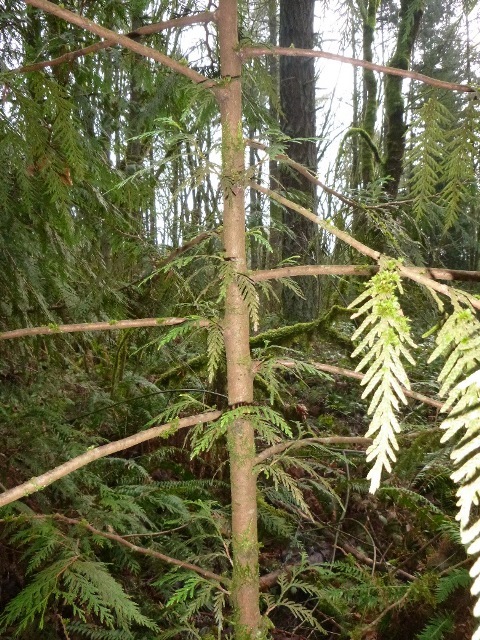 Droopy foliage is also characteristic of western hemlock (Tsuga heterophylla). As you can see in the picture below, with droopy foliage, intercepted water runs off the branch tips, and never becomes stemflow. How does bark effect stemflow? Researchers have discovered that trees with rough bark have less stemflow than trees with smooth bark. Having rough bark increases the surface area of the tree trunk. 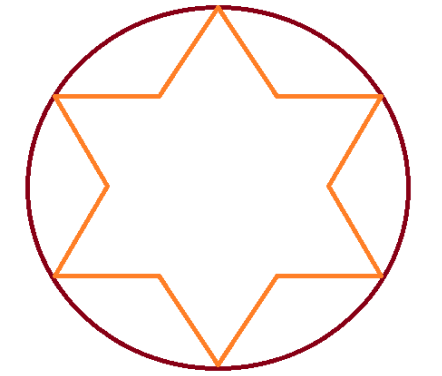 In the diagram below, the cross sections of two hypothetical trees are superimposed, each represented by a different color. While conventional measurements would say both of these trees are of equal diameter, clearly the orange tree, with the rougher bark, has a larger surface area. Research suggests two factors are involved here. The first factor is that before stemflow can start, all of the bark surface area will need to be wet. Trees with rougher bark need more water to get all the bark wet, so stemflow, especially with a light rain, is less. The second factor is that bark itself absorbs some water, and with a larger surface area, more water can be absorbed by the bark, resulting in less stemflow. Less stemflow means fewer epiphytes. 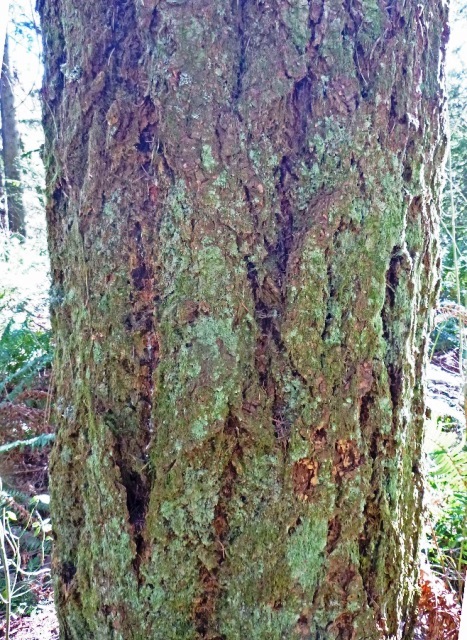 I recently measured the “roughness” of the bark on the Douglas-fir pictured above. The roughness made the actual surface area of the trunk 10% greater than if the bark had been smooth. One accepted method of determining bark roughness is to wrap a string around the tree, and measure how long the string is to determine the circumference. 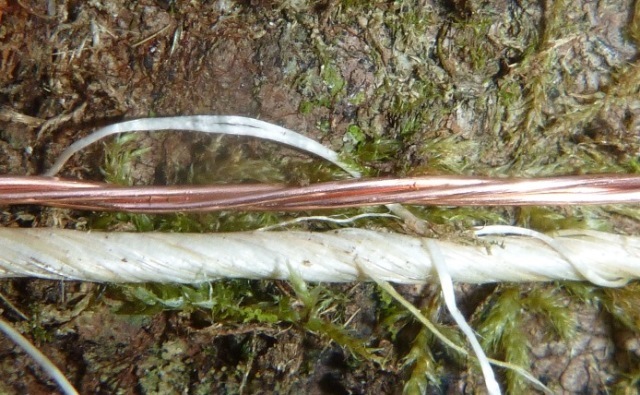 Then a wire is wrapped around the tree at the same height, but as the wire is wrapped around the tree, it is pushed into all the cracks and crevices on the tree. 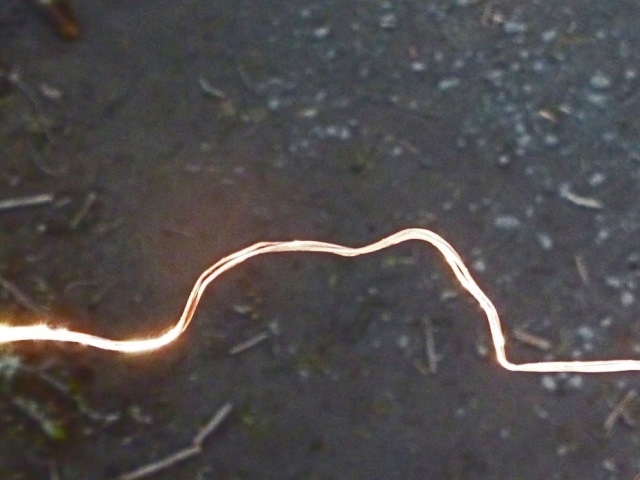 It stays “pushed in” and afterwards the length of wire needed to encircle the tree is measured. The ratio of the additional length of the wire divided by the length of the string is a measure of bark roughness. The process is illustrated below. 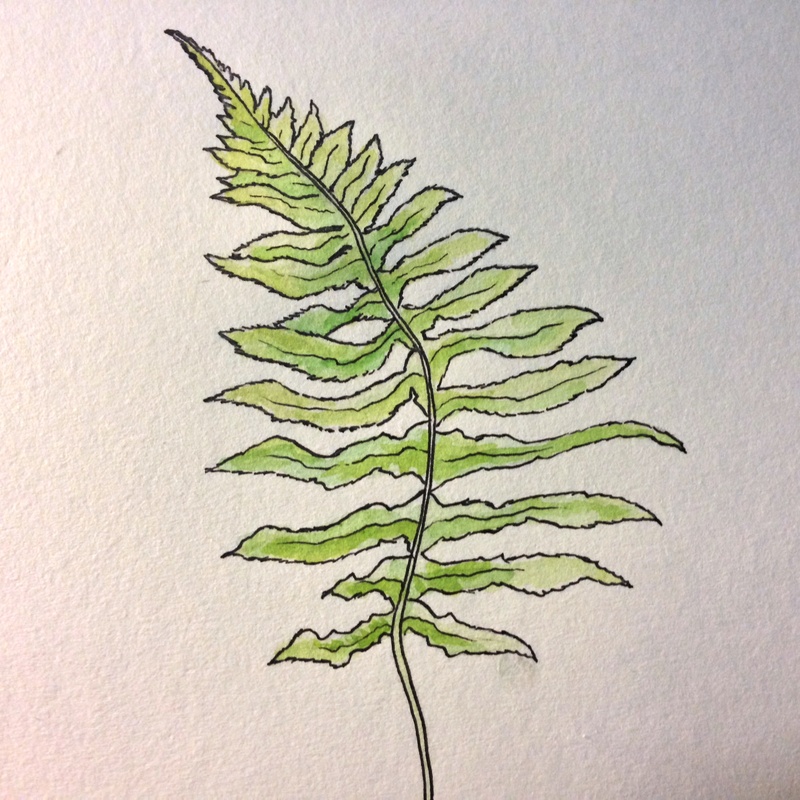 Okay, so where does licorice fern grow? 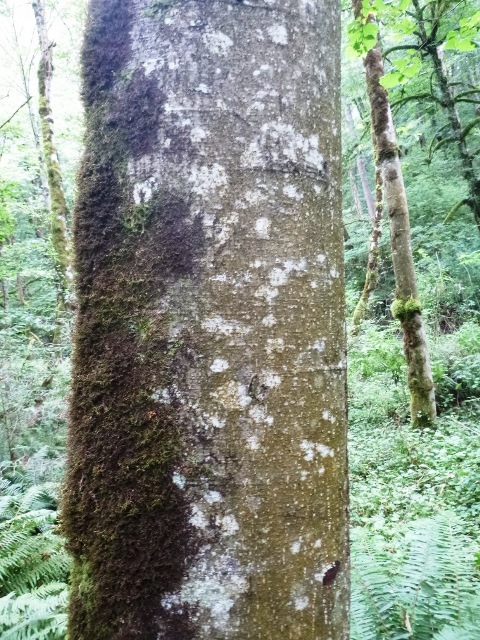 Some believe that bigleaf maple is the only significant host of licorice fern at TCSNA, while red alder will occasionally host a few fronds. To address those beliefs, I turned to the last resort of those truly desperate humans we call “scientists,” actual (No, no, don’t say it!) data! First, looking around TCSNA I managed to find licorice fern growing as epiphytes on living plants of the following species: bigleaf maple (of course), red alder, Pacific yew (Taxus brevifolia), Oregon ash (Fraxinum oregona), Douglas-fir (Pseudotsuga menziesii), black cottonwood (Populus balsamifera spp. trichocarpa) and vine maple (Acer circinatum). Next, to clarify the relationship between red alder and licorice fern, I grabbed a stick about 6 feet long, and walked along Center Trail/Big Fir Trail/Middle Creek Trail as far as Beaver Bridge. Any living alders along that path that I could touch with the stick while standing on the path became a part of my sample. 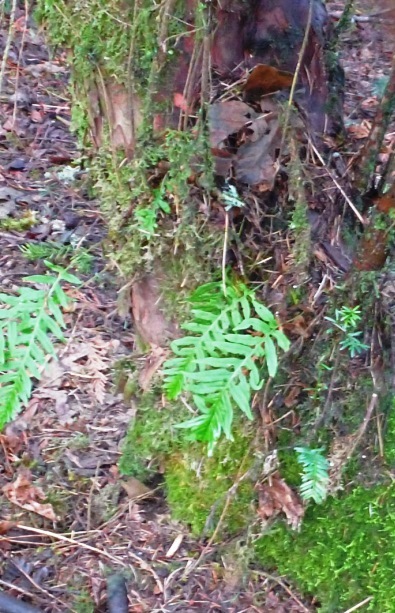 Of the 36 alders in my sample, licorice fern grew on 35 of them (97+ %). Finally, to address the issue of alders supporting only a few fronds of licorice fern, I stopped at three alders with “lots” of ferns and while standing still on one side of the tree, counted visible fronds. On one tree I stopped counting at 50, the next at 75 and at the third tree I stopped counting at 150 individual fronds. 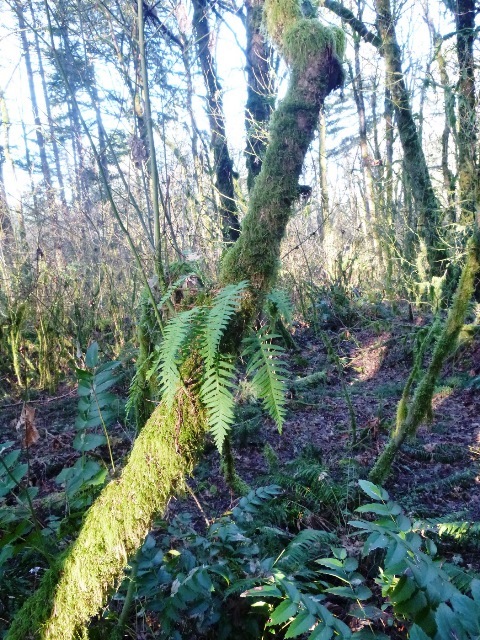 Thus it appears that licorice fern and alder can get along quite well. To be fair, there were a few good-sized alders which supported only 2 or 3 fronds high up in the tree. Your mission, should you decide to accept it…. From year to year, the array of plants in the forest at Tryon Creek State Natural Area (SNA) seems to change very little. 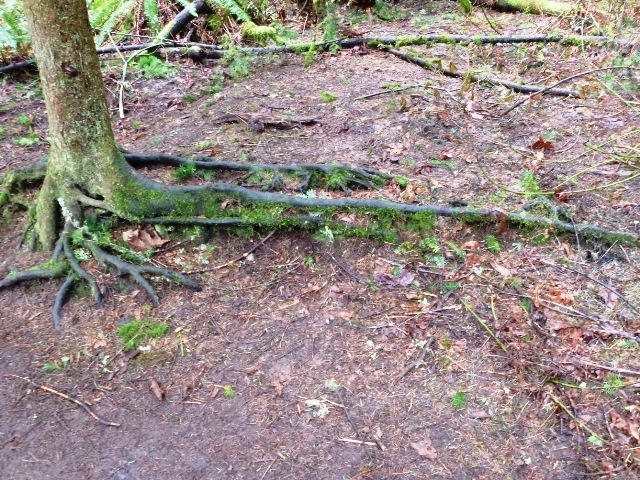 But this apparent stability is an artifact of the human timescale we use to assess the changes in the forest. On a timescale encompassing centuries, the array of plants at Tryon Creek SNA is undergoing constant change. 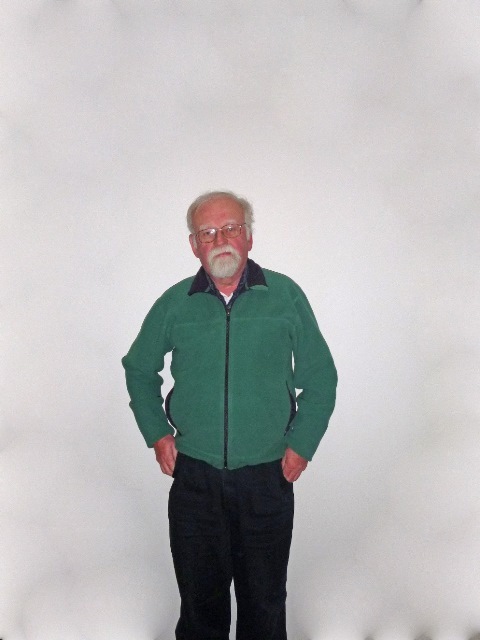 What is Forest Succession, anyway? “Forest succession” is the process by which certain species of plants gradually replace other species of plants. When a landscape is new and barren, such as after a landslide or volcanic eruption, certain plants start to grow in these areas. These are called pioneering plants. These pioneers are adapted to these highly disturbed conditions, and have a huge advantage over non-pioneering plants. However, these pioneering plants slowly and unwittingly change the environment in a way that gradually gives other species an advantage over the pioneers. How do plants change the environment? 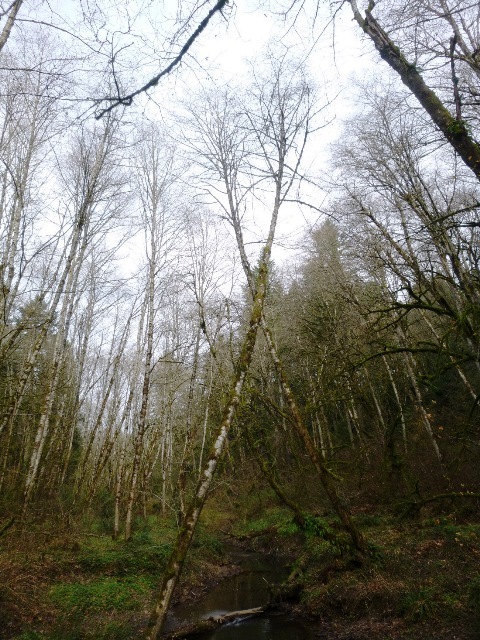 At Tryon Creek SNA, and many other parts of western Oregon, the first trees to typically occupy disturbed landscapes are either red alder (Alnus rubra) or Douglas-fir (Pseudotsuga menziesii), depending upon local factors, for example, soil moisture and the proximity of a seed source. Both of these species do best with full sunlight. 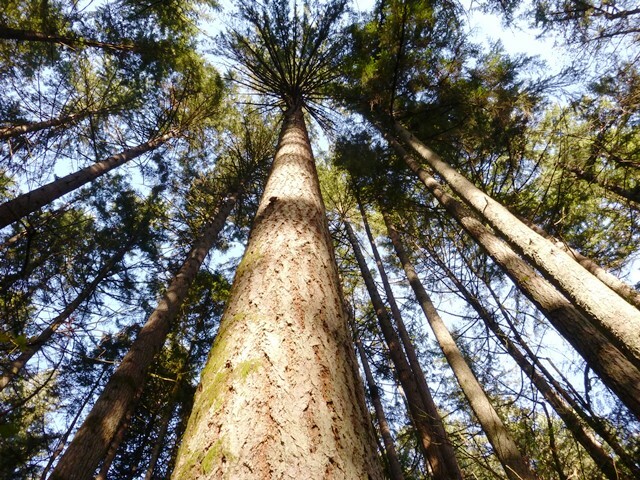 In forestry terms, they are called “shade intolerant,” or simply “intolerant.” One result of their need for sunlight is that the leaves on the lower branches of the mature trees die off due to lack of sunlight, and for these species it’s a long way up to the first living branch, as seen in the photos below. Red alder in the creek bottom. It’s a long way up to the first branch! To demonstrate this intolerance I took a picture of myself standing among some young Douglas-firs at Tryon Creek SNA, click on the tree to see the results. Can’t see the young Douglas-firs? That’s because there aren’t any at Tryon Creek SNA (with the exception of a few that were planted by humans, most of which died quickly, according to long-time volunteer Phil Hamilton). 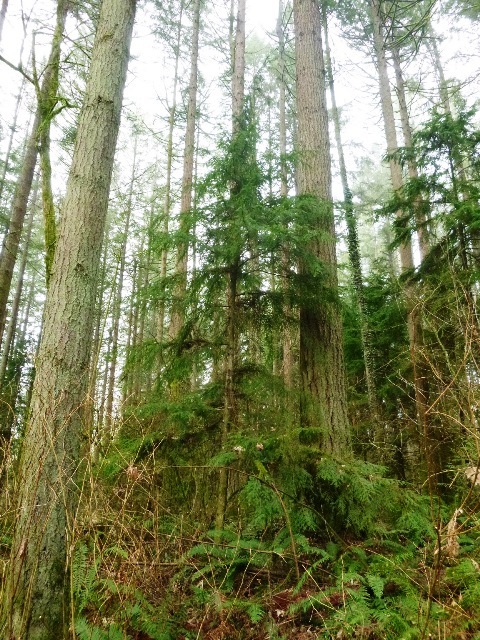 The young Douglas-fir cannot thrive, and rarely survive long, under the shade of older trees. If you let your mind wander ahead about 500 years, roughly the lifespan of a Douglas-fir, you can probably see where this is going. So what happens when the pioneers die? Enter the western redcedar (Thuja plicata) and the western hemlock (Tsuga heterophylla). In contrast to Douglas-fir, both of these species can easily grow in considerable shade, even in the shade of their own parents (there’s a big hint). These species are called “shade tolerant” or simply “tolerant”. There is no better portent of the future than the picture below; a young western redcedar growing at the base of an old Douglas-fir along the Red Fox Trail. 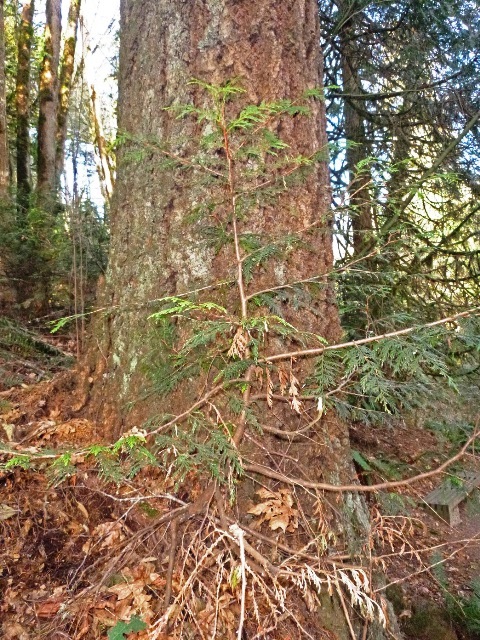 Similarly, there are the many young western hemlocks growing happily under the towering Douglas-fir, like the one below along the Old Main Trail. As you see, because the hemlock is tolerant of shade, unlike the Douglas-fir, it has branches that reach nearly to the ground. I recently did a quick count of young conifers less than about 4” in diameter growing within approximately 10 feet of the Old Main Trail between the Nature Center and the junction with the Red Fox Trail. The tally? western redcedar – 17; western hemlock – 6; Douglas-fir – 0; The best that anyone can recall, only a couple of the western redcedar in this stretch of trail were planted by humans. Do the trees change anything else in the environment? Producing more shade is the main way that trees drive the succession process, but there are a few other factors at work as well. For example, the Naturalist Note of August 18, 2014 highlighted the important role of red alder in converting the unusable nitrogen in the air, into a form of nitrogen the plants can actually use. This process is called nitrogen fixation. Because the alder can do this, they have a competitive advantage over other species on those disturbed landscapes with low nitrogen. But as the nitrogen-rich alder leaves fall to the ground and decay, their nitrogen is added to the soil. With more nitrogen in the soil, the alders make the site better for non-nitrogen fixing species, and hence lose their competitive advantage. Another minor factor in forest succession is when some of the pioneer trees die and fall to the ground. The fallen logs, after they have a chance to decay a bit, are the perfect spot for young hemlock and western redcedar to start growing. These logs are called “nurse logs.” Rotten wood acts like a sponge, and soaks up lots of water that the young trees then use. Additionally, the competition on the forest floor can be intense. At Tryon Creek SNA, the Pacific waterleaf (Hydrophyllum tenuipes), for example, can grow in dense beds over a foot tall, and provide stiff competition for a young conifer seedling less than 2 inches tall. By growing on top of the log, the young conifer seedlings can escape a lot of that competition. Below is a prime example of a western hemlock that got started on a nurse log. The log rotted completely, leaving the roots (see red arrow) above ground level. Western hemlock which started on a now-rotted away nurse log. These nurse logs can help change the forest in a subtle way. There are many examples at Tryon Creek SNA of western hemlock and western redcedar that got started on nurse logs or nurse stumps. However, I’ve never seen a Douglas-fir, either at Tryon Creek, or during my 10 years as a professional forester in this corner of Oregon, which got started on a nurse log/stump. Thus, as the pioneering species die, their remains provide great places for the climax species, and only the climax species, to get started. 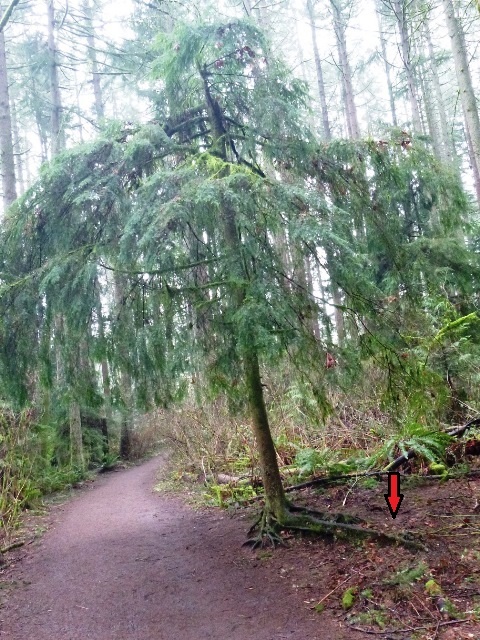 Challenge: Can you find this western redcedar along the trail at Tryon Creek SNA? 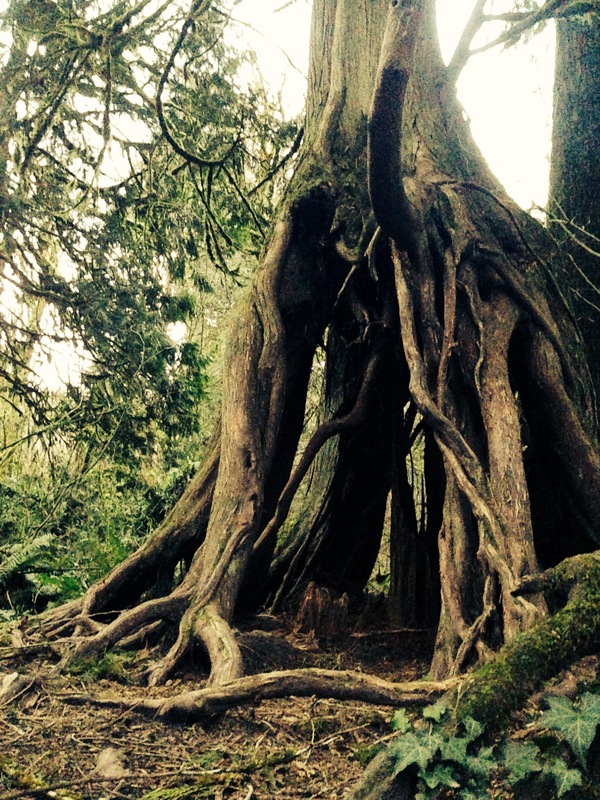 Western redcedar that got its start on an old nurse stump. Exploring the trails of this forest you’ll find signs of what it once was, but now can you imagine what the future will bring? Today we enjoy the big Douglas-fir/alder forest at Tryon Creek SNA. Thanks to the Oregon Department of Parks and Recreation, and the Friends of Tryon Creek, your great-great-great-great-great…. (okay, you get the idea) … grandchildren will be able to enjoy the amazing hemlock and redcedar forest that they will know as Tryon Creek State Natural Area.